I'm excited about my new project: MetaPho, an image tagger. 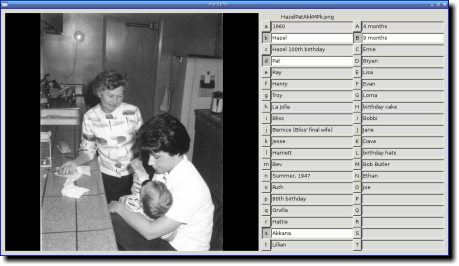 It arose out of a discussion on the LinuxChix Techtalk list: photo collection management software. John Sturdy was looking for an efficient way of viewing and tagging large collections of photos. Like me, he likes fast, lightweight, keyboard-driven programs. And like me, he didn't want a database-driven system that ties you forever to one image cataloging program. I put my image tags in plaintext files, named Keywords, so that I can easily write scripts to search or modify them, or user grep, and I can even make quick changes with a text editor. I shared some tips on how I use my Pho image viewer for tagging images, and it sounded close to what he was looking for. But as we discussed ideas about image tagging, we realized that there were things he wanted to do that pho doesn't do well, things not offered by any other image tagger we've been able to find. While discussing how we might add new tagging functionality to pho, I increasingly had the feeling that I was trying to fit off-road tires onto a Miata -- or insert your own favorite metaphor for "making something do something it wasn't designed to do." Pho is a great image viewer, but the more I patched it to handle tagging, the uglier and more complicated the code got, and it also got more complex to use. I whipped up a demo image viewer in a few hours and showed it to John. We continued the discussion, I made a GitHub repo, and over the next week or so the code grew into an efficient and already surprisingly usable image tagger. We have big plans for it, like tags organized into categories so we can have lots of tags without cluttering the interface too much. But really, even as it is, it's better than anything I've used before. 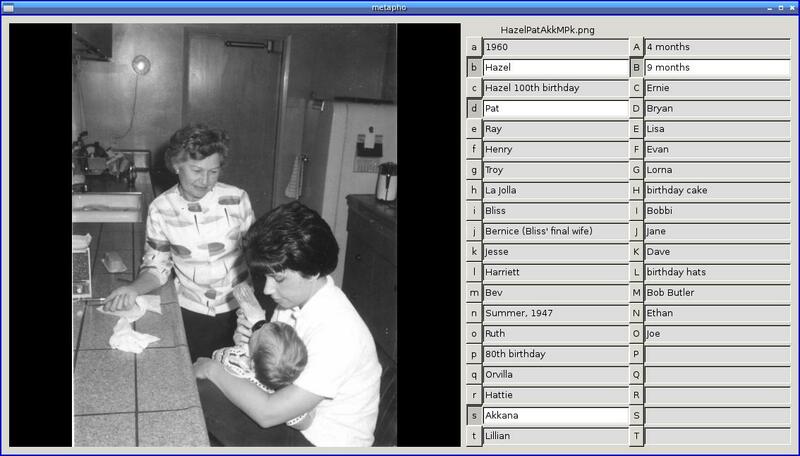 I've been scanning in lots of photos from old family albums (like this one of my mother and grandmother, and me at 9 months) and it's been great to be able to add and review tags easily. If you want to check out MetaPho, or contribute to it (either code or user interface design), it lives in my MetaPho repository on GitHub. And I wrote up a quick man page in markdown format: metapho.1.md. I've been wanting for a long time to make Debian and Ubuntu repositories so people can install pho with apt-get, but every time I try to look it up I get bogged down. But I got mail from a pho user who really wanted that, and even suggested a howto. That howto didn't quite do it, but it got me moving to look for a better one, which I eventually found in the Debian Repository Howto. but seems to work anyway. There's some discussion in the SecureAPT page on the Debian wiki, but it's a bit involved and I'm not clear if it helps me if I'm not already part of the official Debian keychain. And worse, it's an error now, not just a warning, preventing any apt-get update. Going back to the SecureApt page, under Setting up a secure apt repository they give the two steps the other page gave for creating Release and Release.gpg, with a third step: "Publish the key fingerprint, that way your users will know what key they need to import in order to authenticate the files in the archive." So apparently if users don't take steps to import the key manually, they can't update at all. Whereas if I leave out the Release and Release.gpg files, all they have to do is type y when they see the warning. Sounds like it's better to leave off the key. I wish, though, that there was a middle ground, where I could offer the key for those who wanted it without making it harder for those who don't care. Pho 0.9.6-pre3 has been working great for me for about a month, and I've been trying to find the time to do a release. I finally managed it this weekend, after making a final tweak to change the default PHO_REMOTE command from gimp-remote to gimp since gimp-remote is obsolete and is no longer built by default. The big changes from 0.9.5 are Keywords mode, slideshow mode, the new PHO_REMOTE environment variable, swapping -f and -F, and a bunch of performance work and minor bug fixing. I've released Pho 0.9.6-pre3. The only change is to fix a sporadic bug where pho would sometimes jump back to the first image after deleting the last one, rather than backing up to the next-to-last image. I was never able to reproduce the bug reliably, but I cleaned up the image list next/prev code quite a bit and haven't seen the bug since then. I'd appreciate having a few testers exercising this code as much as possible. Otherwise pho is looking pretty solid for a 0.9.6 release.